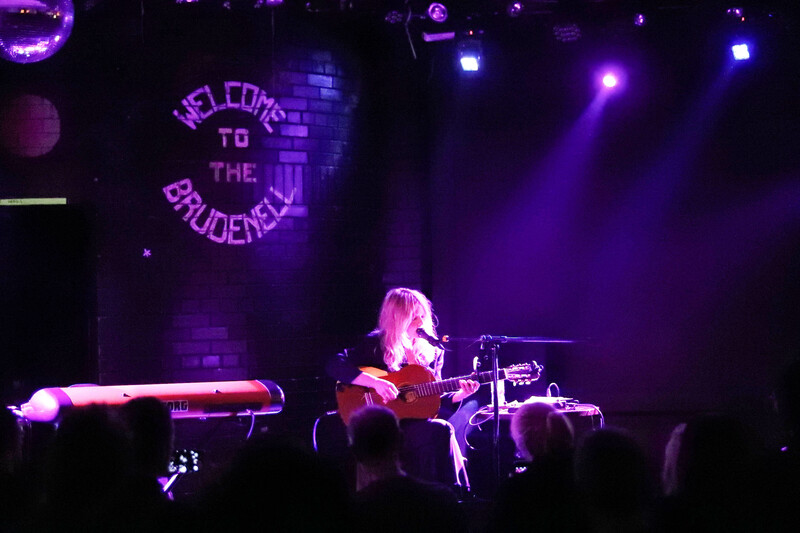 It may well be some three and a half years since Jessica Pratt last played the Brudenell, but to the naked eye everything still looks very much the same. The Californian musician and singer-songwriter is again sat in the middle of the stage, right leg folded neatly over her left knee and armed only with her guitar and a double-handful of beautiful, transcendental songs. But much has changed for Jessica Pratt since that time. Back in September 2015 she was supported by her fellow Los Angeles’ musician Kevin Morby and accompanied on stage by guitarist Cyrus Gengras. Tonight as her opening act she has the mercurial Saul Adamczewski – The Insecure Men and Fat White Family man delivers a vastly entertaining set, including songs about Paul Gascoigne’s tears and the highly troubled Wakefield hardman Paul Sykes – whilst playing alongside her on keyboards and synthesiser is her partner Matt McDermott. And it would seem that the interim period has faced Jessica Pratt with many personal challenges, emotional traumas that can be detected in some of the words on her third album, Quiet Signs. Released last month to widespread praise, Quiet Signs is already being heralded as a likely contender for one of the albums of the year. Jessica Pratt is here in Leeds tonight in support of Quiet Signs on what is the second of five UK dates which form part of a wider tour of Europe and Scandinavia. She initially sidesteps the new record in favour of its predecessor On Your Own Love Again, drawing both the timeless ‘Wrong Hand’ and ‘Greycedes’ from that 2015 release. The gorgeous flute-inflections of ‘Poly Blue’ and the cautious optimism of ‘As The World Turns’ – each song taken from Quiet Signs – illustrate perfectly the emotional and artistic distance Jessica Pratt has travelled over the last few years. Whilst both retain Pratt’s innate thematic sense of the abstract, they build upon this subconscious theme by creating what becomes an even greater awareness of time, space and melody. Being in Jessica Pratt’s musical company is akin to finding yourself suddenly immersed in some surrealistic, meditative dreamscape. Her songs take you to a safe, tranquil place, somewhere that is mystical and immune from extraneous noise. And then with a concluding ‘Titles Under Pressure’ she has gone, such brief contemplative serenity broken by the surrounding tumult of yet another Friday night.